We are an in house pool league for Jester’s Billiards. The main focus of this league is to have fun and win a pool cue. Most of the players in this league are not top players. In fact most Get-A-Cue players are beginner to novice players. If you are new to leagues you are in the right spot! If you are an experience player we are glad you’re here. Here are the Get-A-Cue League Guidelines and Rules of Play! All games will be played at Jester’s. You will play on 9-foot pool tables. This is a singles league, One player teams, 7 games per match. BCA rules apply, no handicaps. This is a fun beginner’s league. 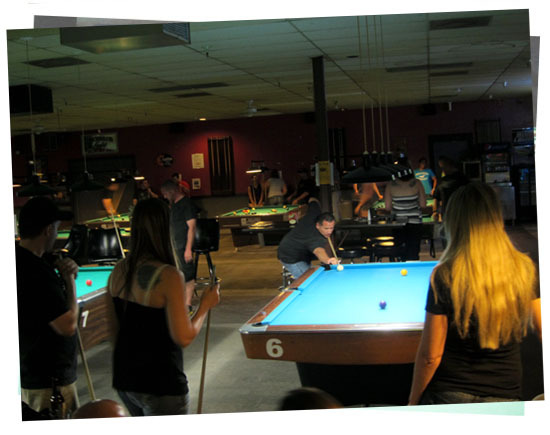 Learn the rules of pool, have fun, Get-A-Cue, play some pool and drink a beverage. Contact Heather Torpin-Cortez for information about our Get-A-Cue Leagues! You can also read all the info online here! 1. The league will last 18 weeks with a tournament and party on week 19. 2. Pick up your league sheets and pool balls from the bartender. 3. League starts at 7:00pm (We open the tables for free practice starting at 6:45pm) and ends at 10pm. If you do not arrive for your match by 7:30pm it will be considered a forfeit. You have 3 hours to complete your match. Return your balls to the bartender when you’re done. 4. The cost is $10 per week and a $10 sign up fee. You must pay a total of $190 for the league. 5. Turn in your score sheet to the bartender. Write on the score sheet how much money you are giving to the bartender and sign the bottom of the sheet. This is your receipt of money paid. 6. You still owe the $10 per week even if you have a “bye” or your opponent doesn’t show up. 8. If you know at least the week before, please let your opponent know so they don’t have to show up if they don’t want to. 9. If you declare a forfeit then your opponent will get the 7 points for the match and no make up is required. 10. If you ask for a makeup you have 2 weeks to complete the match or your opponent will get the 7 points for the match. 11. If you fail to show up or call you will lose all 7 points. 12. If you fail to show or call 2 weeks in a row or a total of 4 weeks you will be dropped from the league and loose all the money you have paid toward your cue. 13. As a paid member of the Get-A-Cue league, you get free pool all day on Sundays. You get fee pool (not your wife, your neighbor, your best friend or anybody else except another league player.) If you get 3 weeks behind in the league dues you lose your free pool privilege on Sundays. 14. If you get more than 4 weeks behind in league dues you will be suspended for 1 week, pending payment. If no payment is received in that week you will be dropped and loose all the money you have paid toward your cue. 15. If you get 3 weeks behind in the league dues you lose your free pool privilege on Sundays. 16. Everyone is here to have fun and play some pool. Please leave bad attitudes at home. Chill out – it’s just pool. Everybody wins the same thing at the end of the league: A POOL CUE. 17. League is played on 9 foot pool tables. 18. If you want to play in the smoking area that is fine as long as your opponent wants to. 19. We follow the BCA (Billiard Congress of America) Set of rules. You can get them from their website. 21. Have fun and enjoy yourself! 1. If you make the 8-ball on the break it is a win. Good Job. Do it again! 2. If you make the 8-ball on the break and scratch you lose. Sorry, you must control the cue ball. 3. You lag to determine who breaks the first game. Alternate breaks after that. 4. Ball in hand means just that. Put the cue ball in your hand and place it ANYWHERE on the table to line up your best shot. 5. All you have to do is call the ball you are going to make in the pocket you intend to make it in. You do not need to call kisses, caroms, banks, or combinations. Just the ball and the pocket. 6. A ball made on the break only means the breaking player gets to continue. Balls made on the break do not determine whether you are stripes or solids. The ball pocketed after the break does. 7. A legal break means at least 3 balls must hit a rail. If 3 balls do not hit a rail the incoming player has the option to re rack the balls and break or take ball in hand and play the rack as it lays. 8. You must hit one of your balls first or it is a foul. 9. You must pocket a ball or have a ball hit a rail (cue ball included) or it is a foul. REGISTER NOW WITH OUR REGISTRATION PAGE! You can review the league standings from here! Check out our Specials page for our daily drink specials and click on the Current Beerlist link for a PDF of our current beers on draft, and in bottles and cans. Jester’s maintains a selection of beers and wine ranging from the “cheap” to the “exotic.” We have 20 beers on tap! We are PROUD of our beer selection! Come in for a PBR, and stay for the craft beers.